THE THEFT OF one of the country’s most expensive greyhounds has been likened to the infamous IRA kidnapping of former champion Irish racehorse Shergar. Clares Rocket, which has an estimated stud value of around €1 million, was stolen last Monday from the kennels of Irish Derby winning trainer Graham Holland. Thieves targeted Holland’s Riverside Kennels, Golden, Cashel, Co Tipperary, around 1am, making off with the much sought after racing dog. 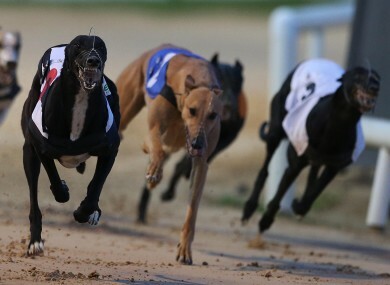 Prior to the robbery, Clares Rocket was listed as one of the favourites for the English Derby – one of the most valuable and prestigious greyhound races in the world. This is really the Shergar story of the greyhound industry. “If you look at his card, I think (the dog) has won over €53,000 in prize money and I would say for stud purposes he could be worth in excess of €1 million,” they added. Clares Rocket is a previous winner of the Champion Stakes and the valuable Produce Stakes, and was a favourite this year for the Con and Annie Kirby Memorial Puppy Stake. The dog is owned by the Full House Syndicate, headed by Joe Cahill. Gardaí in Golden confirmed that they are investigating the matter. The Aga Khan owned Shergar was taken at gunpoint by the IRA from Ballymany Stud in Kildare, on 8 February 1983. On his debut he had famously won the Epsom Derby, later adding a trilogy of victories – the Irish Derby and the King George. Having covered 35 mares in his first season in stud, at fees up to £80,000 a time, Shergar was syndicated for £10 million. Email “Theft of €1 million racing dog 'is Shergar story of greyhound industry'”. Feedback on “Theft of €1 million racing dog 'is Shergar story of greyhound industry'”.